Soapwalla offers hand crafted cosmetic from New York City. Rachel Winard began making skin care products in her Broklyn apartment in 2002. She was diagnosed with systemic lupus, a chronic, systemic autoimmune condition that also affects the skin. She started to look for products for her sensitive skin. As she couldn’t find anything suitable she began to make her own holistic face and body products of the highest quality. She started to study aromatherapy, the therapeutic properties of essential oils, old wives’ tales and current cutting-edge research on herbal therapies and cell regeneration. Today, Soapwalla’s product line includes soap bars, face serum, deodorants, body oils, exfoliating polish, lip balms, body washes, and many more. The products are solely made from natural oils, clays, powders, botanicals, and essential oils. Every product is made by hand in small batches to ensure quality and freshness. 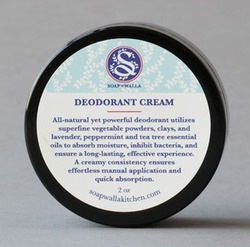 The Soapwalla deodorant creme is all natural. It uses vegetable powders and clays, as well as lavender, peppermint and tea tree essential oils to absorb moisture, inhibit bacteria, and ensure a long-lasting and highly effective experience. Another range of hand-crafted deodorants is offered by Organic Island Deodorants from the Florida Keys. They are made from completely natural and organic ingredients, such as Shea butter, coconut oil, jojoba oil, aluminum-free baking soda, organic corn starch from Austria (GMO free) and probiotics. They smartly combine the all-naturla ingredients to fight odor. They even work in a hot and humid climate. The vegan version does not contain probiotics (as they are derived from milk) and uses candelilla wax (wild crafted from a plant), instead of beeswax. Organic Fair Trade Shea Butter, Organic Coconut Oil, Organic Corn Starch, Baking Soda, Wild Crafted Candelilla Wax, Organic Jojoba Oil. made with unrefined Shea Butter and Jojoba Oil as well as Virgin Coconut Oil (cold-pressed). It comes in a fancy clear container.